The French paradox of low incidence of heart disease and svelte French women was explained long ago. Now, resveratrol re-emerges as a messiah for just about any cure. So go get your anti-oxidant pill in a goblet now. It’s a wonder enzyme called Resveratrol. And evidence is mounting up in its favour. Vision researchers at Washington University School of Medicine in St. Louis discovered that resveratrol stops out-of-control blood vessel growth in the eye. The discovery has implications for preserving vision in blinding eye diseases such as diabetic retinopathy and age-related macular degeneration. According to University at Buffalo endocrinologists, based on results from the first prospective human trial of the extract conducted, resveratrol appears to suppress inflammation in humans, hence benefitting those with inflammatory diseases like rheumatoid arthritis and cardiovascular disease (medically described as inflammation of blood vessels). The natural antioxidant protects against a range of illnesses and diseases including neurodegenerative diseases such as Parkinson's or other dementias, cancer and heart disease and has been more recently documented for its role in extending lifespan. So what exactly is resveratrol? It’s a popular plant extract and a compound produced naturally by several plants when under attack by pathogens such as bacteria or fungi. It has properties that can prolong life in yeast and lower animals due to its anti-inflammatory and antioxidant properties. Found in red wine, grapes, blueberries, peanuts and other plants and produced by chemical synthesis derived primarily from Japanese knotweed, it is sold as a nutritional supplement in many parts of the world. Resveratrol’s introduction into the dietary supplement market a few years back was based upon the consideration that intake of it and other polyphenol compounds from red wine may contribute to the “French paradox”, the unexpectedly low rate of death from cardiovascular disease in the Mediterranean population, despite a diet that is relatively high in saturated fat. Since then, interest in resveratrol has increased due to research suggesting additional antioxidant, anti-inflammatory anti-cancer, antiviral, and anti-aging effects, as well as possibly playing a role in weight loss and athletic performance. Some clear benefits over the years have emerged. Cardiovascular health: Resveratrol inhibits platelet aggregation (i.e., the clumping together of blood platelets that can lead to formation of blood clots and subsequent blockages in blood vessels resulting in insufficient blood flow, heart attack or stroke). It also promotes increased blood flow by enhancing the production of a naturally occurring substance in the body called nitric oxide, hence decreasing the risk of thrombosis (clot formation) and atherosclerosis (hardening of arteries). Antioxidant properties : Free radicals are formed due to age, lifestyle diseases, stress or exercise. Resveratrol scavenges on the free radicals directly. Test tube research has shown that resveratrol prevents the oxidation of LDL particles (the “bad cholesterol”). Anti-inflammatory: Our bodies manufacture cyclooxygenase (COX) enzymes, which perform various functions. One such function, inflammation, is necessary as a normal, healthy attempt by the body to heal itself. However, when inflammation gets out of control (such as in the case of arthritis, or other chronic inflammatory disorders), resveratrol inhibits COX enzymes, as well as other inflammatory substances. Some evidence suggests that resveratrol is more potent anti-inflammatory than NSAIDs such as aspirin, ibuprofen, or indomethacin. It also reduces cartilage destruction. Anti-cancer effects: Long-term inhibition of COX significantly reduces the risk of developing many cancers. 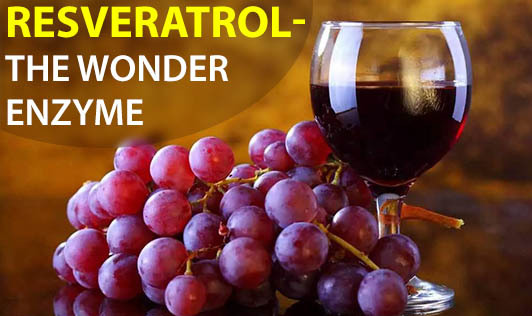 In test-tube research, resveratrol has been found to inhibit the proliferation of various human cancer cell lines, including those from breast, prostate, stomach, colon, pancreatic and thyroid cancers. This is due to a combination of inhibition of COX and angiogenesis (the growth of new blood vessels). For tumors to grow, angiogenesis must take place so that blood vessels can develop in order to feed the tumor. Antiviral activity : Resveratrol was found to block the influenza virus from transporting certain proteins, thereby restricting the ability of the virus to replicate. It also suppressed the activation of herpes simplex virus proteins, and reduced the production of viral DNA. Anti-aging: Resveratrol increases the production of SIRT gene, found in humans and other mammals that helps promote survival by protecting cells during times when food (and therefore energy) is scarce. SIRT acts as a "rescue gene," repairing the damage done by free radicals and preventing cells from dying prematurely. Weight loss potential: Obesity is biologically characterized at the cellular level by an increase in the number and size of adipocytes (fat cells) that develop from pre-adipocytes in adipose tissue. Resveratrol has been shown to inhibit pre-adipocytes, which may translate into reducing the production of new fat cells. Now you know why French women are slim despite the cheeses they eat? So is it good enough to incorporate wine and peanuts in your diet? As long as you’re not going overboard on the junk, sleeping well, this wonder enzyme may just add that glow to your health. Now go get your goblet of red wine! And don’t forget to snack on the humble singdana!